Apple shares reversed intraday losses and gained slightly after hedge fund manager Doug Kass tweeted a rumor of Apple announcing a stock split at tomorrow's shareholder meeting. However, Kass subsequently sold on the run up and then disavowed the rumor as impossible and unlikely to actually happen. Kass' tweet of "hearing a rumor that Apple will announce a stock split at tomorrow's shareholder meeting" appeared to turn around losses the stock had incurred earlier in the day, followed by shares rising just over 1 percent afterward. 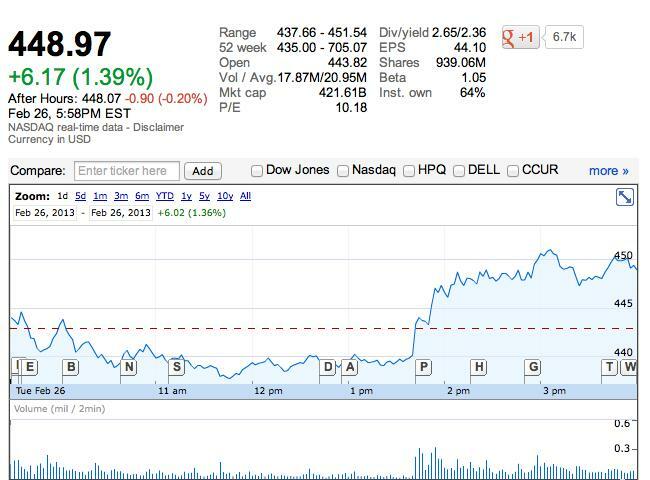 Apple's shares ended the day at $448.97, up just under 1.4 percent for the day. However, after being credited with the change in prices, Kass subsequently responded by saying, "If you think one person can move Apple on a rumor you are in the wrong business." Kass then announced via Twitter that due to the rise in Apple's stock, "Prudence dictates that I sell off some of this outsized position." He later announced he was "paring back" his Apple holdings because "the company would require a shareholder vote to split the stock." He added, "the [stock split] rumor seems to be baseless based on current share authorization," as Apple's articles of incorporation only allow a 2-1 stock split. "Which is no big deal," he added, "[Apple] must seek auth. for more." Kass meant that for Apple to split shares greater than 2-1, it would have to gain authorization through a vote by shareholders. Kass (second from left) also writes for The Street, founded by Jim Cramer (second from right). Six years ago, Cramer outlined how hedge fund managers spew false information to create either panic and excitement that could be used to drive stock prices up or down, allowing for easy profits for stock manipulators who can effectively seed false information. "You cant foment, Cramer said in a video interview appearing on The Street website. Thats a violation. You cant create yourself an impression that a stock is down. But you do it anyway because the SEC doesnt understand it. Thats the only sense that I would say that it is illegal. But a hedge fund that is not up a lot really has to do a lot now to save itself. "This is actually blatantly illegal, but when you have six days and your company may be in doubt because you are down, I think it is really important to foment." "This is actually blatantly illegal, he added, but when you have six days and your company may be in doubt because you are down, I think it is really important to foment. If I were one of these guys, foment an impression that Research In Motion isnt any good, because Research In Motion is the key today," he said, speaking in 2007. It might cost me $15 to $20 million to knock RIM down, but it would be fabulous because it would beleaguer all the moron longs [investing in RIMs success]. After creating a loss by fomenting a false outlook with bad news, manipulators can then take advantage of their own downswing in share price and profit. Cramer next discussed how Apple was "an ideal short" because hedge fund managers know when they lie about Apple, "the people who write about Apple want that story. And you can claim that it is credible because you spoke to someone at Apple, because Apple isnt in [a position to comment on unannounced products]." Asked by his interviewer about the fundamentals of the market (the actual performance of companies) compared to the mechanics of the market (the artificial actions taken by traders in a game of buying and selling shares), Cramer dismissed the idea saying, The mechanics are much more important than fundamentals. "The great thing about the market is that it has nothing to do with the actual stocks. Maybe two weeks from now the buyers will come to their senses and realize that everything they heard was a lie." "Who cares about the fundamentals?" Cramer asked. "Research in Motion just blew out the quarter. But look what people can do. Thats a fabulous thing. The great thing about the market is that it has nothing to do with the actual stocks. Maybe two weeks from now the buyers will come to their senses and realize that everything they heard was a lie." Cramer then concluded, "I think its important for people to realize that the way that the market really works is to have that nexus of: hit the brokerage houses with a series of orders that can push it down, the leak it to the press, and then get it on CNBC; thats also very important. And then youll have a vicious cycle down. Its a pretty good game. It can be played for a percent or two." Share splits back on the table at Apple? While much of the conversation in anticipation of Apple's shareholder meeting scheduled for tomorrow morning has centered upon a proposal by Greenlight Capital's David Einhorn to issue preferred stock tied to increased dividends, the chatter about stock splits reignited a subject that's been in discussion for some time. Unlike dividends, which would distribute a fixed portion of Apple's cash to shareholders over time, a stock split wouldn't do anything to directly increase the value of holding Apple shares. However, some observers have hoped a share split would make owning Apple shares easier for smaller investors. A stock split, which would simply divide each existing share in half (or into some other set fraction) is seen as potentially making the shares seem more affordable or simply dispel irrational feelings that the current share price is "too high." Apple last issued a 2 for 1 share split on February 28, 2005; it announced similar splits in the summer of 2000 and the summer of 1987. At last year's shareholder meeting, members of Apple's executive team said they had discussed a stock split along with dividend plans and a share buyback program. The company subsequently announced a 4 year dividend and buyback plan, but did not announce any plans to split shares. Chief executive Tim Cook noted that one downside to splitting shares is that it could increase fees paid by some parties to execute trades. Overall, however, any effects would largely be symbolic rather than having any real impact on the value of Apple's shares. At the same time, the idea promoting a share split is that it would induce a new wave of buyers, hopefully propelling the share price upward. After hitting highs above $700 last fall, Apple's shares have tumbled down into the low end of the $400 range, essentially vaporizing all the gains Apple earned since late 2011. This occured despite 2012 being the company's most productive and profitable year, generating record new revenues and earnings. Apple now takes in the most profits of any personal computer maker, earns the vast majority of the profits of the entire mobile industry, and accounted for the largest segment (one fifth) of consumer electronics in the US.